The hopelessly disorganized seem to be a species all their own: on the one hand, much like anyone else, they do enjoy traveling; on the other, though, their chronic inability to get organized often causes them to freeze up and/or fly off into a panic. 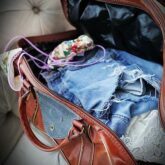 If you belong in this very special category, check out our list of twenty vital clothes packing tips, which are guaranteed to bring order even into the lives of the most desperately messy travelers out there. It may sound pretentious, but this is one of those packing luggage tips that comes from a trustworthy source: “When you figure out your suitcase, you figure out your life”, said acclaimed fashion designer Diane von Furstenberg. And she’s right. Want to turn your life around? You’re certainly not the only one: according to a Post Office poll, 37 per cent of British travelers say they’re disorganized. 55 per cent of women find it harder to pack than men – but, in earnest, about 30 per cent of women also pack the bags of their male companion. Traveling light has been touted endlessly, as the best way to make a journey. And, as far as travel packing advice goes, it’s still sound advice – but the truth is that, when packing, you want to utilize as much of the space available to you as you possibly can. What’s your ultimate goal? To avoid creasing your clothes. How do you do that? There’s a wide range of methods, which include folding, bundling, rolling, plastic wrapping, etc.. Whatever you choose, make sure you get everything in there packed in tightly. Ziploc bags work particularly well, as does vacuuming up your wrapped clothing items. No, we don’t mean professional psychotherapeutic aid. However, if you want a couple of tips, instructions, or tutorials on the best and quickest ways to fold up your shirts, you can either check out Butler Bureau, or the countless video tutorials on YouTube. 4. How much can I bring along? Sky may be the limit for some, but the truth is most airlines have several strict rules about the type of cabin luggage you can bring along. Typically, in terms of air travel packing tips it’s one piece per person, weighing in at 44lbs (or 20 kg), and measuring about 22in in height. 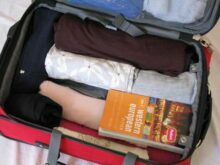 Such a suitcase is able to carry two pairs of long bottoms, five shirts or t-shirts, three sweatshirts, cardigans, or sweaters, and two dresses. It all starts with rounding up all the clothes you expect you’re going to need on your journey. Try to categorize them as much as possible, either by function or by color. Then, mentally dress yourself up, from your toes all the way up to your ears. You are actually creating several distinct outfits for your stay – and the key is to bringing along more tops than bottoms, since they tend to get dirty quicker. Then, once you’ve got all your outfit elements down pat, subtract one of them and leave it behind. In most cases, you’re still not going to wear everything else that you’ve packed up. As for shoes, follow the rule of three: one comfortable shoe, loafer, or sandal, one running or track shoe, and a dressier shoe, if the occasion calls for it. Remember that heels are always complicated to pack, because of their shape and stiffness. There are some items which inevitable crease, no matter how well you pack them – but there are also others which are better suited for traveling. Knitwear, wool, cotton, and some synthetics tend to fare better when packed up. It’s actually advisable to do a bit of both, depending on the type of garment and fabric you’re working with. According to the acclaimed author of The Packing Book, Judy Gilford, you can safely (and tightly) roll up cotton pants, knitted items, underwear, jeans, and t-shirts, since they either don’t crease, or can also be worn a bit creasy. On the other hand, if you’re packing any rougher or stiffer fabrics, such as blazers, shirts that require starch, or any other clothes for special occasions (dresses, skirts, etc. ), you need to fold them properly. And, you know what? If you live in London, you can actually pay a professional service to do this for you, as well as wash, dry clean, and iron all your clothes. Do you bake? Great! It’s going to come in very handy for brushing up on your traveling packing tips, since you’re essentially going to approach your suitcase like one big cream-filled cake. The bottom layer consists of the rolled up items, the filling will be the folded ones, while around the rolled items, you can stuff belts, shoes, and other accessories (hint: go easy on the expensive jewelry, watches, etc.). It’s also advisable to top everything off with a dry cleaning clothing bag, which will keep the clothes rolling around during the journey. This is a good thing, since they won’t settle in one place long enough as to develop creases. Note that, if you’ve been following our clothes packing tips up to this point, you stand before a light, organized suitcase, full of essential items. Some of your clothes are actually versatile enough to be used for several purposes: leggings, for instance, can be paired up with a comfortable tunic shirt, but they can also be used for sleeping in them. Some pairs of pants can turn into capris or even shorts, and you can even use knitwear as pillows, either on the road, or at your destination. Ideally, you should ask if the hotel or hostel you’re staying at has laundry facilities, but make sure to also inquire about the price, since such services do tend to be on the pricey side. This is especially true on cruise ships, so come prepared. If you don’t want to pay for doing the laundry, pack soap sheets or a small pack of detergent, as well as a sink stopper and a laundry line. You’ll be good to go, in fresh new clothes, in a matter of days.